Commercial surrogacy: Josh and Sean Szeps' path to fatherhood. In September 2017, Sean and Josh Szeps walked out of a Minneapolis hospital with their beautiful newborn twins, Stella and Cooper, buckled into their car seats. With the help of two selfless women, the couple had created their perfect “instant” family. But in Josh’s native Australia, the way these little babies were brought into the world is against the law. 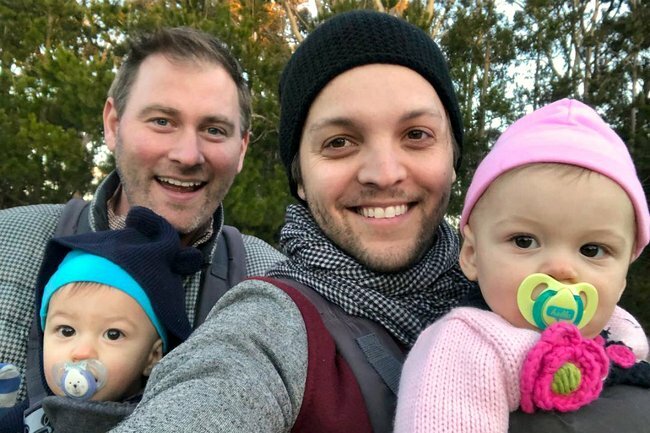 Speaking to Mamamia‘s No Filter podcast, Josh, a host on ABC Radio National, explained that he and his American husband’s children were born via a commercial surrogacy arrangement; in other words, the woman who carried their children was financially compensated. The couple, who were living in Los Angeles at the time, sought her services via a boutique surrogacy agency. Under Australian law, only ‘altruistic surrogacy’ is permitted, meaning the surrogate can’t receive any financial gain from the arrangement. How Josh and Sean’s surrogacy arrangement unfolded. Though Josh was open about his desire to start a family, it wasn’t always a consideration for Sean. But when they got married in 2014, something changed. They began investigating adoption; they researched agencies, had meetings. But around that time, a college friend of Sean’s reached out with an incredible offer: she would carry a child for them. The friend ended up carrying for another person, but the idea of surrogacy appealed to Josh and Sean. They took a year to do research, to mull over the options, the cost. It was important to Sean that they both had a genetic link to their children, so he floated the idea of egg donation among his female relatives. Josh would provide the sperm. “When you have right in front of you the possibility of both being connected to the children, to it being the same family tree, just something came over me, and I remember being really like, ‘Josh, this is gonna cost us, no joke, a hundred thousand dollars more than adoption, but it has to be the path we take,&apos;” he said. Ultimately, the process went about as smoothly as it could: the couple was matched with their surrogate within six months and she fell pregnant after a single cycle of IVF. Commercial surrogacy remains a divisive topic. Many critics argue that it can lead to exploitation of vulnerable women (in particular, those in low socio-economic communities) and that it essentially commodifies human life. Advocates, on the other hand, believe it would be unfair for a consenting woman to carry a child and receive nothing in return. It’s currently only available in a small number of countries, including some US states and Russia, with varying restrictions. In most cases, though, the mother is not legally permitted to be genetically linked to the child. Instead, the biological parents’ embryo is implanted into her womb. Costs vary, too. According to non-profit organisation Families Through Surrogacy, surrogacy in the United States will cost roughly US$68,000 (AU$95,000); add on IVF and other associated costs and that figure can climb beyond US$100,000 ($140,000). For Josh and Sean, it was about looking beyond the equation to the human life – well, lives! – at the end of it. To the moment they could their children in their arms for the first time. When it came, Sean said, it was the greatest day of his life.